Our cable display kits are supplied with 4 metres of cable, top fitting, bottom spring tensioning system, screws and wall plugs. Each cable can be cut to length to suit its environment. Additional wall brackets are required for each cable kit, for wall mounted applications. Wall brackets are optional within the product page. The illustrations below shows the various ways that our cable display system can be used. 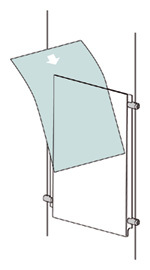 Easy access poster holders, also known as pockets, are ideal for displaying posters that require regular change.They are made from clear acrylic with polished edges. Easy access poster holders can be used with our cable display systems, for floor to ceiling fixing or wall fixing. See below for further descriptions of our cable display system. Easy access poster holders can also be used with our wall mounted grips to fix directly to the wall. Available in US Letter size. Choose the right type of grips to suit your application. In general, four grips are required for each poster holder used. Appropriate if aesthetics is the deciding factor. Appropriate if functional is the deciding factor. Holds up to 6mm panels. Holds up to 2mm panels. Larger size makes it easier to install. Smaller size means a little more accuracy is required to install. If you are installing a long series of cable displays, it's possible to save time and effort, from drilling lots of holes, by using cable tracks. For example, if you are installing a cable display set of 4 across and 3 down (Display Set 4x3), you would need to drill 5 holes along the floor and another 5 along the ceiling. These holes would need to be fairly accurately drilled to suit your poster sizes. If you were to use a cable track and fittings along the floor and ceiling instead, you would only need to drill a few holes for each track to attach to the floor and ceiling. 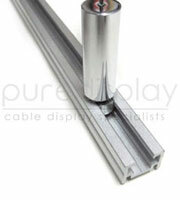 It would then be possible to slide the cable kit & fittings along the track until it's in the correct position. The tracks also provide the flexibilty to change the posters in your window display from one size to another, if you should need to in the future. Dimensions for standard US paper sizes. You can start to buy ready made configurations right here and pay online with a credit card. Simply go back up to the top of the page and browse through the side menu categories. Select the items and add them to the shopping cart. Checkout and complete your details followed by your method of payment. Once you have placed your order, you will receive a confirmation email. When the order is dispatched, you will also receive a notice of delivery. You can login at anytime with your email and password to check your order and previous orders.